The picture only gets rosier for the Liberals when we turn to likely voters. The six-point lead expands to eight points when we adjust for likely voters. Our guess at this point is that the ballot box issue of minimal government versus active government was the deciding factor in this late shift. 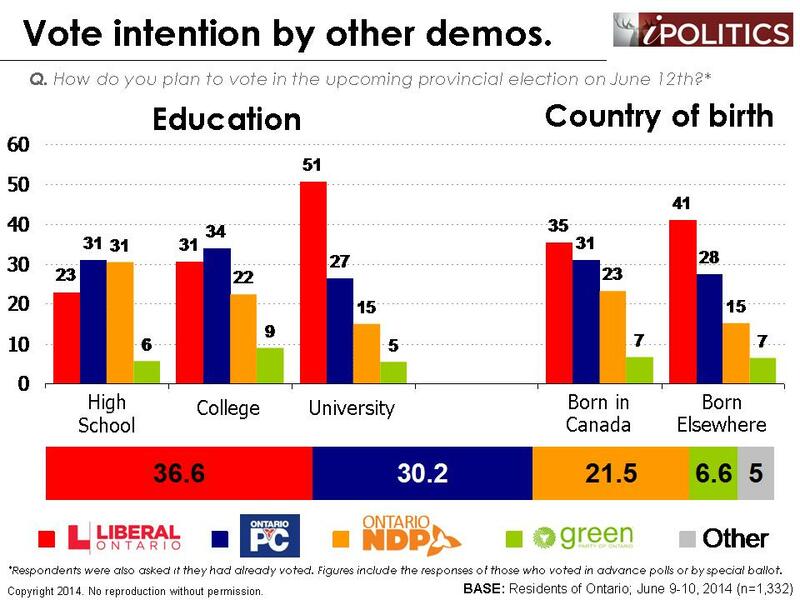 It was what had sustained a solid (albeit modest) lead for Wynne up until the debate. The debate shifted voter focus from this high ground to the low ground of ethics and regime fatigue. It now appears that the electorate have chosen the earlier issue as the more important one and that this will propel Wynne to a clear and surprising victory. Looking at the demographics, we see the Liberals have re-established their lead with women and those ages 45-64, while the Progressive Conservatives still lead with seniors and – although statistically insignificantly – with men. 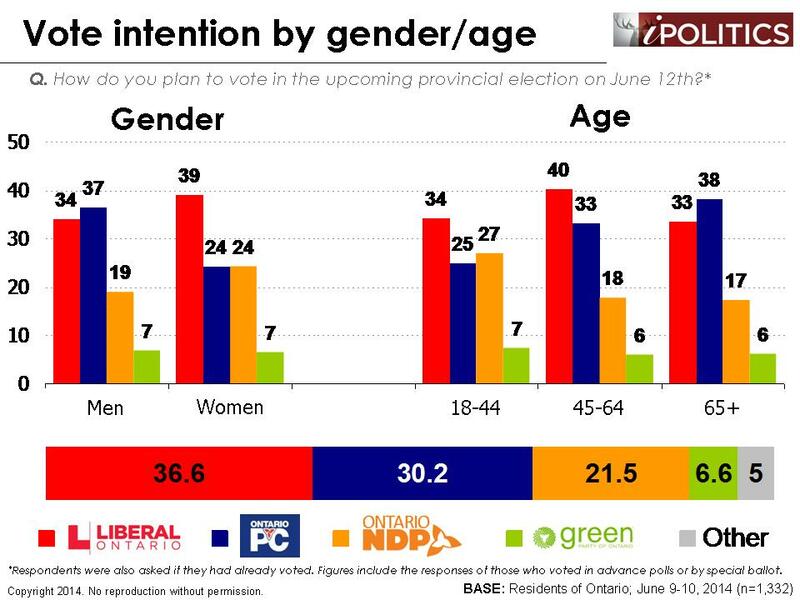 If there is good news to be found for the PCs in this poll, it is that much of their loss has been concentrated among those under 45, a group with a particularly low propensity to vote anyway. The Liberals have also pulled into a tie with the PCs in Eastern Ontario. The exact cause of this last shift is unclear (and it may very well be a one-time blip), but it could be related to recent confusion over whether a PC-led government would support Ottawa’s LRT expansion. One final comment on the polls: We have never seen the erratic and confusing patterns that might be drawn across other polls. In our polling, the trends and demographics have been stable and well behaved. 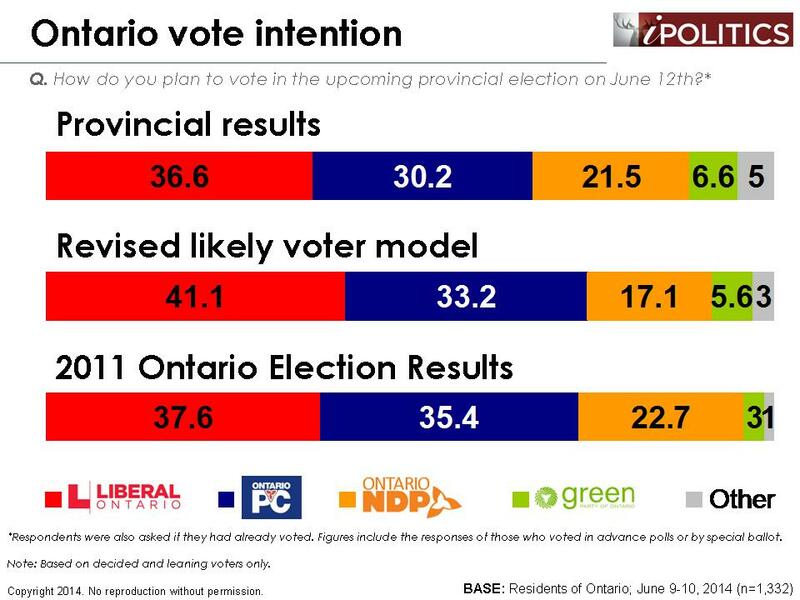 Apart from a single point where Hudak moved ahead Wynne has maintained a stable lead and she now has clearly recaptured this. 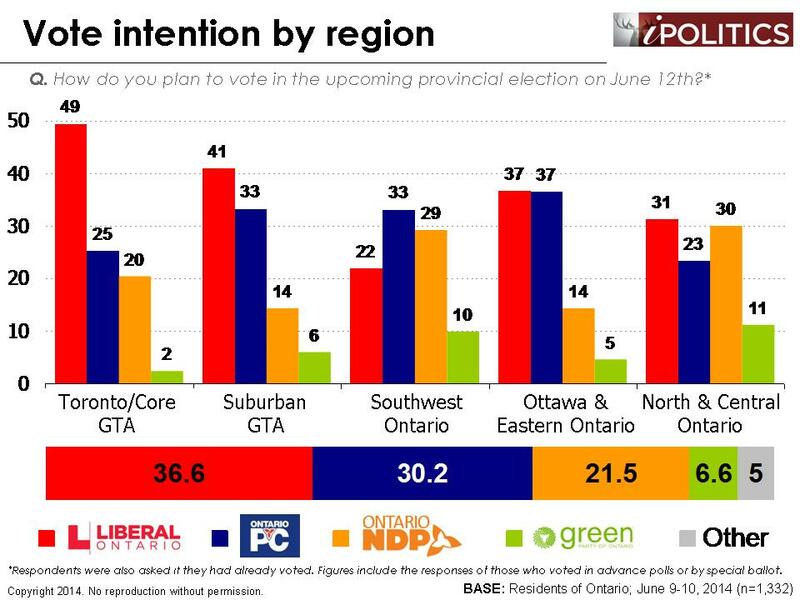 So we will restate our earlier conclusion that the race is headed to a Wynne victory and most likely to a majority. We could, of course, be wrong. But we don’t think so and all will be clear in two days. While looking at our likely voter model, we felt that we might not be giving enough weight to the role of education and age in shaping turnout, as our past research has shown that university and college graduates are considerably more likely to vote that those limited to a high school education or less. Consequently, we have added a new item to the index which assigns a score of 2.0 to those who have completed either a college or a university level education. Education (maximum score of 2 points). The respondent receives 2.0 points if they have completed either a college or university education. Finally, we tally the scores and identify the ~50 per cent of the population that is most likely to show up and vote on Election Day. In this case, we take all those respondents who score 7.5 or greater (out of a maximum possible score of 10.0). The field dates for this survey are June 9-10, 2014. In total, a random sample of 1,332 Ontario residents aged 18 and over responded to the survey (including a sub-sample of 1,092 decided voters). The margin of error associated with the total sample is +/-2.7 percentage points, 19 times out of 20. 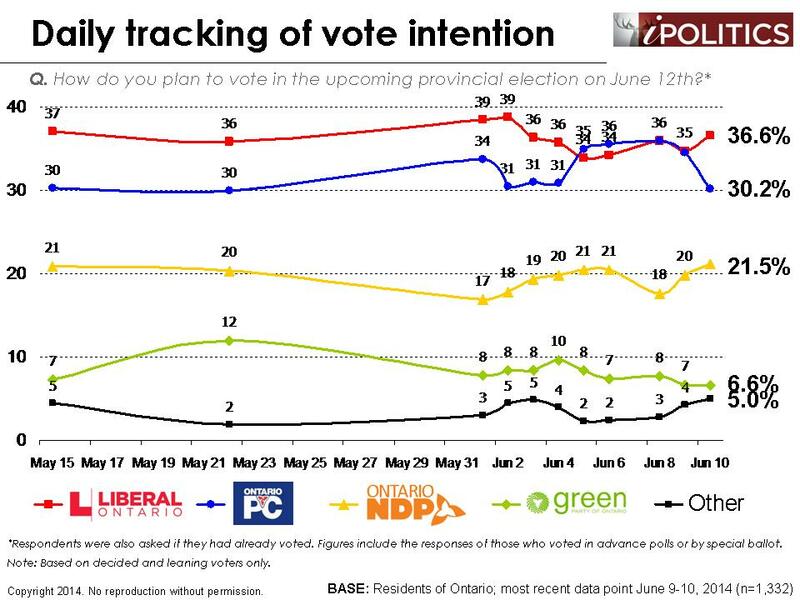 As far as I can tell, your polls have been quite consistent in showing the liberals ahead. There was one major deviation two days after the debate, and maybe a second smaller one two days after that. You interpreted the first blip as perhaps due to a delayed effect of the debate. But as you have said, debates rarely make a big difference. Moreover, a deviation that large would usually occur only after a really spectacular negative event for the liberals and there was none. Remember that each daily polls less reliable than the larger ones done earlier, I would suggest that a better explanation is that the big leap for the PC was a statistical blip, not a real change. If you did a trend analysis, I would guess that it would not show a significant deviation from linear. Just a thought but as you have said, it is a mistake to overinterpret individual results.Time series is often helpful in giving perspective on deviations. Great job on the polling and your comments on the other polls.